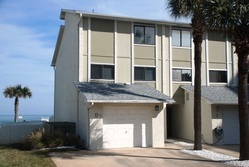 Oceanside Village is a well-kept small direct oceanfront townhome community complex located on A1A in New Smyrna Beach Florida. 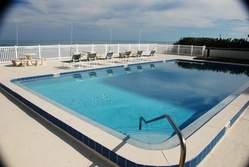 Built in the very early 80’s, Oceanside Village consists of 21 two bedroom and two and one half bath units. All but three have an attached and private one car garage. The interiors consist of two or more levels, with bedrooms and living areas separated. There is a large private pool and deck area protected by a full-sized seawall with direct access to the no-drive portion of the beach. Unique to Oceanside Village is that fact that the units are not condominiums but actual townhomes. This generally can make obtaining financing much easier.